Bullies at the poker table are always challenging to deal with. They tend to use large stacks of chips to push around players with smaller chip stacks by forcing them to risk all of their chips to play. Poker Bullying is even more pronounced in online poker tournaments. This article is about how to play effectively against an online poker bully. It’s also about how you can sometimes BE the poker bully to increase your chances to win. Poker bullies in live poker are often big and loud. They try to intimidate their opponents. This is easier to do while playing live, but it’s also possible to do online… especially if you have a large chip stack in comparison to everyone else at the table. In cash games, only you can let a poker bully change the way you play. You can always buy in for more chips in a cash game so you should simply concentrate on playing good poker and forget about the size of the bully’s stack. That is unless the size of their stack matters when it comes to making a call hoping to be paid off when you hit your hand. You have to always remember in a cash game that stack size has little to do with playing correctly, especially when it comes to starting hand selection. The only time stack size matters in cash game play is when you are considering pot odds and the possibility of future money going into a pot later in the hand. The type of bully who uses his or her size and / or mouth to try to intimidate opponents in live play is at a disadvantage while playing online. They are reduced to using only stack size and the text box. If another player is running their mouth via the text box on the poker software you are using, and it’s bothering you, simply turn this function off, or stick a post it note over it on the screen! Players with big stacks acting like bullies can actually be profitable to play against. They tend to call bets that they shouldn’t based on the size of their stack in comparison to the bet. This is money that you wouldn’t get out of a different player. For example, if you have a stack of 100 chips and the table bully (with a stack of 2000) has raised to 20 before your turn to act, you can often push all in with your best hands like A-A or K-K and the bully will call. This is a terrible play on the bully’s part, but it doesn’t look like it to them because his or her stack is so big. Online poker bullies also tend to make larger than standard raises before the flop in order to scare off smaller stacks. This means you should limp less and wait for big hands to play against the bully. If the average stack size at the table is 200 and the bully has 2500, a raise to 100 is not much to him or her but represents a large percentage of everyone else’s stack. By playing tighter than normal you can quickly double up against an aggressive bully. In tournament play, it is often more difficult to deal with a bully. This is because there is a limited number of chips available, assuming it is past the re-buy period or if it is a no re-buy tournament. When you have a small stack in comparison to the largest stack at your tournament table, it is important to always be aware of where the big stack stands in the current hand. If they’re to your left, you need to make sure you have a strong hand before you enter the pot. Unless you are extremely short stacked, you should only play hands you are willing to call an all in bet with by the bully before you enter a pot. Big stacked bullies will force you to play for all of your chips in a tournament. This increases as you go deeper into the tournament. 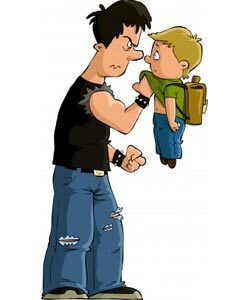 Of course if the bully has acted before you, you have additional information which can help you make the correct decision. While bullies in tournaments do at times make big raises with marginal hands, you need to be careful not to assume they have a poor hand. Another trap in tournament play is when a bully makes a large raise and you are pretty sure you have a better hand, but there are still players to act behind you. This is a trap that has ended many tournament players day. Don’t forget that there are other players at the table, not just the bully. You can use bullying tactics to your advantage if you know what you’re doing. Bullying works best against loose, passive players. In a cash game, often players buy in for short stacks and hope to double up quickly. They’ll get all in if they can with marginal hands, like 10-10, 9-9. or even A-Q. This is a good opportunity for you when you have a strong hand. You can also camouflage your big hands if you have a large stack and get away with making larger than normal raises and getting called. For example, if the standard raise at the table is 20 but you have a large stack and have been opening for 40, you can get calls with large pocket pairs because the rest of the table can’t put you on a hand. It’s important not to play too many hands though, because you still have to play tight aggressive poker in order to win in the long run. Don’t ever assume someone is going to fold just because your stack is larger than theirs. In addition, never fall into the trap of thinking that it is just a small amount to call. Every chip you win or lose is part of your lifelong game of poker. That 100 chip call may only be a small percentage of your current stack, but that is no reason to call when you should fold. That 100 chips might come in handy in your next session. In a poker tournament, many of the same strategies for bullying work as those mentioned above. The most important thing to remember when you are trying to bully around your opponents in a tournament is that each and every chip is important. There are only so many chips in play and if you get caught with a poor hand trying to bully a short stack, you can double them up and hurt yourself for the rest of the tournament. The better use of your chips as the big stack at the table in a tournament is often to limp or make small raises with your big hands hoping to lure the small stacks into moving all in over top of you. Most of the time players view limping and small raises as signs of weakness. Of course, as the level of competition increases it is less likely that you will fool people. Once again, don’t fall into the trap of forgetting when you have players yet to act behind you. Just because a small stack has moved all in and you have a decent hand does not mean it is smart to make the call. If you have a medium stack behind you who may raise, you may be forced to fold after calling the first all in bet or playing the hand for more chips than you wanted to. Hopefully this article has given you some information on how to act when someone at your table is trying to be a Poker Bully. Be calm and never let a bully wind you up. Try and find a way to turn the tables on the bully and punish the only way that will hurt him, by taking a chunk of his chip stack and making him watch you add them to your chip stack… now that’s a sweet feeling!